From the designer: Hole #2 looks pretty simple and short and it can be - as long as you are accurate with your tee shot. Yes, it's only 171 feet long, but there's usually a tricky wind coming from the left. Leave your tee shot short (in the Valley of Despair) and you will have a rather steep uphill putt. Tee shots that go long or to either side can have a pretty scary backdrop behind the basket. From the B tee Hole #2 is arguably the most difficult hole on the course. The tee shot is blind - do you go down the path and curve left, or do you pump one over the trees and hope it lands safely? Hit the trees and you are sure to land OB. 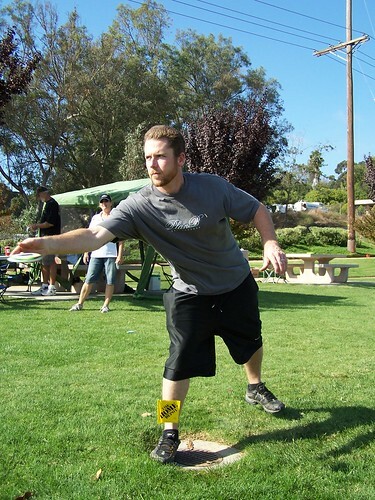 The Local's View - Dave Vincent, San Marcos resident on the cusp of a PDGA player rating of 1,000: Hole 2 is my favorite hole and has the most contrasts between the short and long pads at Montiel. From the the short pad its a very straightforward hole that is an easy birdie if not overshot. It is a must birdie when playing in competition. From the long pad, the basket is not visible but there are two distinct routes to take to the basket. You can opt left and take the route over the OB riparian habitat, or you can take the tight tunnel route on the right. Neither one of those is an easy shot, in fact I think this is the most difficult hole on the course. 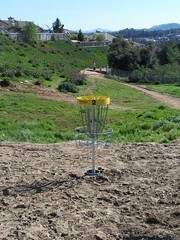 This is a bonus birdie in competition, most players will be happy with a par, so a deuce is a stroke on the field.